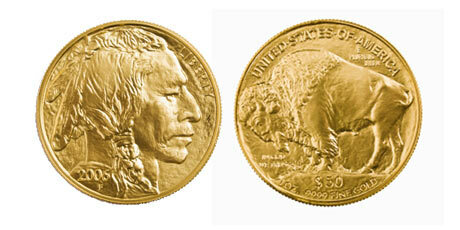 The American Buffalo, also known as a gold buffalo, is a 24-karat bullion coin first offered for sale by the United States Mint on June 22, 2006. The coin follows the greatly admired design of the Indian Head nickel and has gained its nickname from the American Bison on the reverse side of the design. This was the first time ever that the United States Government has minted pure (.9999) 24-karat gold coins for the public. The coin has a legal tender (face) value of $50. The obverse (front) of the coin depicts a Native American, whom Fraser said he created as a mixture of the features of three chiefs from different American Indian tribes, Big Tree, Iron Tail, and Two Moons, who posed as models for him to sketch. Atop a mound of dirt on the reverse (back) of the coin stands an American Bison, which commonly are referred to as buffalo. The animal depicted on the reverse is believed by most to be the bison named Black Diamond, who lived in the New York City Central Park Zoo during the 1910s. It is said that Fraser had to have someone distract the buffalo while he sneaked to a position beside it to draw. Otherwise, the buffalo would turn to face him and Fraser couldn’t get the profile he wanted.